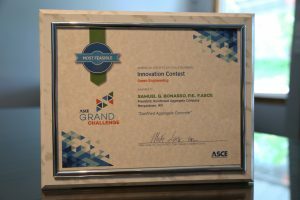 A tire reuse technology, Confined Aggregate Concrete, recently won the first American Society of Civil Engineers (ASCE) Grand Challenge Infrastructure Innovation Contest for most feasible green engineering idea. What is Confined Aggregate Concrete? Confined Aggregate Concrete is sold as Mechanical Concrete® and is a geosynthetic technology that confines any crushed stone or aggregate material inside of a thin-walled cylinder. This confinement dramatically improves the load supporting capacity of the stone. It is “green” because, in its most economical configuration, it reuses one of society’s most high-quality industrial products: used/waste automotive tires. Confinement makes stone particles several times stronger than conventional compacted stone. 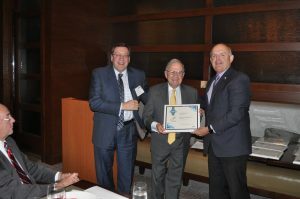 Terry Neimeyer, PE, CEO of KCI Technologies, a national engineering firm from Baltimore, Md., presented the award at the ASCE Innovation Contest Green Engineering Event in Reston, Va., May 18. KCI senior engineering personnel participated in the green engineering selection process. How Does Confined Aggregate Concrete Work? Samuel G. Bonasso, PE, a Fellow of ASCE and president of the Reinforced Aggregates Company, discovered Confined Aggregate Concrete in 2004 while looking for a better way to dispose of waste tires and received a U.S. patent for the technology in 2008. Currently, Mechanical Concrete® is being used in 30 projects in five states. In the field, it has reduced maintenance on gravel surfaced public and industrial roads by 75%. Confined Aggregate Concrete is an open source outside of the U.S. and Canada and can assist the developing world in creating a viable, four season, farm-to-market road system without modern construction technology. Bonasso graduated in civil engineering from the University of Miami, Fla., and West Virginia University. He is an inventor with five U.S. and Canadian patents and is a career civil engineering consultant and structural engineer. He has also served publically as the West Virginia Secretary of Transportation and Deputy Administrator, Research and Special Programs Administration and USDOT, Washington.